TrafFix Devices ANSI/ISEA Class III Safety Vests come in a variety of styles and colors to meet your safety needs. Whether you need a high visibility, reflective safety vest or a highly reflective supervisors vest with pockets, TrafFix Devices has the vest to suit your needs. Our Mesh material is a soft, lightweight fabric that meets or exceeds the specification for ANSI/ISEA 107-2010. This lightweight, breathable material allows air to flow through the vest, keeping it cool on hot days, yet durable enough for the construction industry. 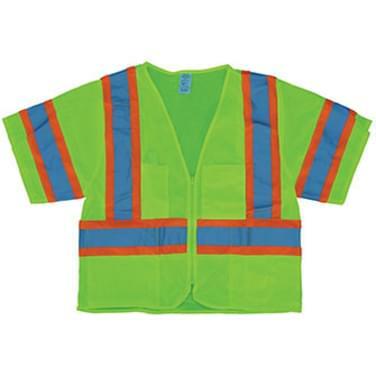 Lime ANSI Class III lightweight polyester vest with one (1) 2" horizontal and two (2) 2" vertical silver reflective stripes on the body, and one (1) 2" horizontal stripe on each sleeve. The vest has no pockets and a front Velcro closure. Available sizes range from Medium to 4XL. 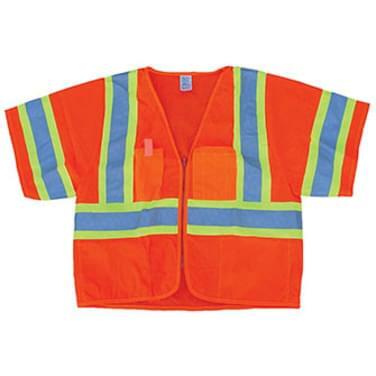 Orange ANSI Class III lightweight polyester vest with one (1) 2" horizontal and two (2) 2" vertical silver reflective stripes on the body, and one (1) 2" horizontal stripe on each sleeve. The vest has no pockets and a front Velcro closure. Available sizes range from Medium to 4XL. 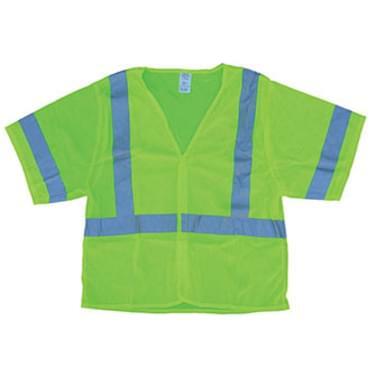 Lime ANSI Class III Supervisor's mesh vest with one (1) 2" horizontal and two (2) 2" vertical silver reflective stripes on the body, and one (1) 2" horizontal stripe on each sleeve. Each reflective stripe has Orange 4" non-reflective backing stripes. The vest has two (2) sewn on over-sized bottom pockets located inside the vest. This vest is complete with a heavy duty zipper closure and sizes range from Medium to 4XL. 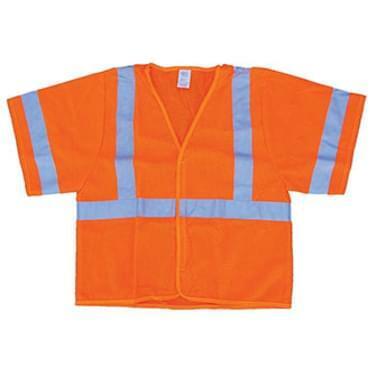 Orange ANSI Class III Supervisor's mesh vest with one (1) 2" horizontal and two (2) 2" vertical silver reflective stripes on the body, and one (1) 2" horizontal stripe on each sleeve. Each reflective stripe has Orange 4" non-reflective backing stripes. The vest has two (2) sewn on over-sized bottom pockets located inside the vest. This vest is complete with a heavy duty zipper closure and sizes range from Medium to 4XL.